WaterAid should know better. This graph perpetuates the dangerous lie that charities’ spending on governance and fundraising is somehow separate from ‘work on charitable objectives’. They’re not: they’re integral to it. First, what does this graph actually say? It states that 23% of WaterAid’s spending is not on its charitable objectives. Call the regulator: this seems to be admission of fraud or deception on a giant scale. The graph states that WaterAid’s fundraising and governance are not work ‘on our charitable objectives’: what do the trustees talk about if not its our ‘charitable objectives’? In a well-run charity every penny is spent in pursuit of the charitable objectives. Second, why is this graph there? Presumably because WaterAid thinks potential donors will be impressed by how much of their money goes ‘to the actual cause’ and how little gets ‘wasted’ along the way. So WaterAid trains donors to think that a charity’s job is simply to ‘carry’ money from the donor to the beneficiary with minimal depletion. In fact, any decent charity will ADD value to donors’ money – through expertise, volunteers, economies of scale, partnerships, learnings from elsewhere, and so on. Many beneficiaries have been well-served by organisations doing R&D, or campaigning, or knowledge management, which may result in none of the money going ‘to the actual beneficiary’ and yet have massive impact. WaterAid’s graph makes it harder to raise funds for that type of work. Third, it goes the wrong way. This graph – and others like it – implies that the less a charity spends on governance, the better. How wrong. Any decent organisation has great governance, and invests in it since it strengthens the organisation’s ability to serve beneficiaries. 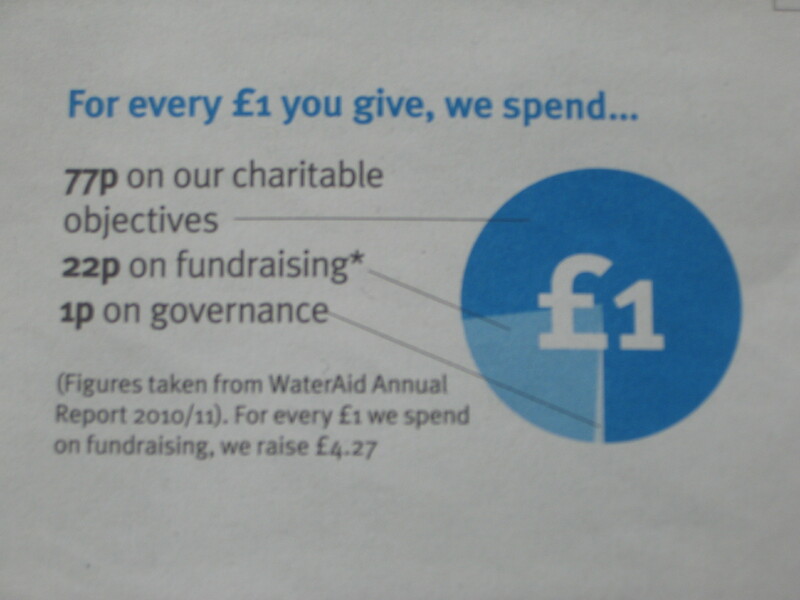 So, we learn from this graph that WaterAid doesn’t value its governance. It also seems to think its fundraising isn’t for ‘our charitable objectives’ – what is it raising money for then? The evidence shows that the best charities spend more on both admin and fundraising than do the bad ones. So, by showing off the lowness of its spend on those items is, WaterAid is providing evidence that it’s no good. The sole criterion on which donors should choose charities is their effectiveness. And the sole criterion which responsible charities encourage / educate donors to use is effectiveness. WaterAid should grow up. In the interests of beneficiaries, many of are trying to guide donors towards being more effective, and graphs like these don’t help. The misinformation that efficiency = effectiveness makes life worse for beneficiaries by training donors to choose ineffective organisations. This entry was posted in Admin costs, Great charities and tagged admin, administration, administrative, charity, donation, donor, donor education, effectiveness, efficiency, Fund-raising, Fundraising, giving, governance, water aid, wateraid. Bookmark the permalink. 22 Responses to WaterAid: what are you thinking of? Suppose Charity A spends £100,000 pa on fundraising and raises £1million. Charity B spends £1m on fundraising and raises £3m. Which is best serving its beneficiaries? Which has the more effective fundraising? Arguably on pure ROI, Charity A is best, but we’d all surely agree that Charity B is doing the better job (unless B should really be achieving a lot more for its expenditure). That’s fundraising effectiveness. Would agree 100% with Caroline that the better measure is effectiveness for the beneficiaries. I’d argue that those numbers don’t indicate who’s doing a better job for beneficiaries. They simply tell you who’s got the higher fundraising ROI. Charities vary substantially in their (cost-)effectiveness, so it’s quite possible for one to achieve more for beneficiaries with £1m than another does with £3m: there’s an article on here about a charity that’s 25x as effective as another. Due to the high profile author, presumably, this page is one of the highest in Google’s search results when searching for information about the effectiveness of Water Aid. Anyone searching for such information – perhaps prompted by the leaflets distributed across the UK by the regional water companies – will end up here. How helpful do you imagine this aggressive, expletive-laden rant is for potential donors or the charity itself? It begins with ‘shame on them’ and contains the comment “WaterAid is providing evidence that it’s no good”: I think from the context you are criticising the type of evidence used (and the interpretation you are assuming readers will apply to it), but readers – and particularly skim-readers – could be forgiven for thinking you are criticising the performance of the charity without any of the evidence you are attacking them for not presenting. I share the desire for better measures of charitable performance (which is how I came across this page), and I understand your frustration. However, I think much more care should be taken when publishing high-profile criticisms of charities to ensure that fund-raising is not adversely affected. Regarding the expenditure graph itself, clearly it is far from a complete picture of the effectiveness of the charity, but I still find it better than nothing. Firstly, presenting it is an indication of a tendency towards transparency: as you say, some potential donors might be concerned by even 22% of administrative and fund-raising costs, so this is not necessarily a trivial step. Secondly, it may not measure the effectiveness of the charitable programmes at all: but it must provide some evidence of appropriate management. I accept your point that significant expenditure on fund-raising and administration is necessary, and minimising it might be counter-productive: but clearly it cannot be acceptable to maximise it either! A charity with very cost-effective programmes (per pound of expenditure on ‘charitable objectives’ as WaterAid put it) would be very poorly served by an organisation with such ineffective fund-raising that most of the donations were spent on attracting donors. If you happen to have any evidence-based view of the performance of WaterAid, it might help to redress the balance if you would add it to this page. Posting here to say many of the same points! Good to see I’m not alone in our endevour! I personally believe this pie chart is informative and in fact I’m glad I clicked on a link to this blog post because the pie chart was exactly what I set out to find. Why this Author believes that this piechart is such an indictment of Water Aid is beyond me. It just seems petty and like a bad piece of writing to focus on such a small piece of “evidence” while giving such little in the way of context. I find the piechart served a much better service of informing me of WaterAids different areas of spending (which yes is of interest to me) than it did at providing evidence of why WaterAid should “grow up” and “know better”. This would be better served as a private blog entry than a public one because it does so little to inform as is of very low quality but I’m glad you got your feelings off your chest. Not true. The cost-effectiveness of a programme is independent of the cost of raising funds to enable it. Activities in a charity to raise funds are remarkably independent of activities to serve beneficiaries: there’s a whole chapter on this in my book. The cost of fundraising (the amount of “donations spent on attracting donors” is a function of (a)the type of donor which the charity has to deal with: attracting retail donors is more expensive than attracting foundations, but foundations simply aren’t an option in some cases, and (b)the amount of work which those donors make the charity do: foundations often create loads of work for charities, which drives up their fundraising costs. This all is also discussed in the book. Here is the other way to look at this. People who defend, or advocate, using admin costs as a measure of a charity’s effectiveness need to show that admin costs correlate with effectiveness. By which I mean that they need to produce some evidence, rather than just an argument. I’ve never seen or heard of any evidence which points that way, but would be very interested to see any. I agree with this completely: this was part of my point. Where we disagree seems to be on whether there is any value in assessing the cost-effectiveness of fund-raising. I can accept that fund-raising costs vary between charities and types of donor, and perhaps there are very effective and worthwhile programmes that justify extraordinary expenditure on fund-raising. I just feel that this information is of interest to potential donors. If a charity spends, say, 75% of income on fund-raising, small donors (whether private or corporate) are essentially being asked to donate to a fund-raising programme, not to the ‘headline’ charitable objectives. I’m not saying this would be unacceptable: just that it is legitimate for donors to take this into account, and charities should not be criticised for enabling them to do so. The reason for my post was really the specific attack on one particular charity. I still think it would be helpful for you to clarify whether or not you have any particular view, one way or the other, on their performance. Perhaps this is also discussed in your book, but you cannot expect readers of internet posts to buy a book in order to contextualise your comments! Caroline- glad I’m not the only one who gets a little ‘passionate’ about these things!! You’re absolutely right that these are misleading, and indicate that the smaller the sections on fundraising/governance the better. But I’m less concerned that they’re providing ratios, and a pie chart, which many, many of the top charities do, and which donors do look for, and I suspect finding them missing reject some charities out of hand. For me the issue is that they have stuck a pie chart in there with no explanations- they grabbed the readers attention but left them to draw their own conclusions And again I agree with you that those were probably the wrong conclusions! What’s your view? Another thing – I noticed that at least WaterAid linked these back to their (audited) financial statements, probably making these the only measures in that report with any indication of external review or reliability. The only thing I know about Water Aid is that it does not wholeheartedly support drinkable book Project. Instead it goes on about how working with local government and water companies (which sell water) saying that the ‘book’ can be good only in times of emergency. if it was serious about providing clean water to the desperate it should direct a portion of its fund to this project. Methinks it is trying to discourage the drinkable book because if it is widely successful who will pay for the salary of its governance? Pingback: Development or Develovogue? – What development means to me now. | Development or Develovoge? The point surely is that low admin costs encourage ordinary people to donate to a very good cause whether low admin costs are thought to be better or not. I will not contribute to any charity which has an expensive London HQ. I will not contribute to any charity paying its top earner more than £100k. Simple, really. A friend of mine told me recently that he knows someone who worked, briefly, for a water providing charity (I’m assuming it was this one, but not certain.) He was employed in the actual digging of wells, and had intended it to be a lifelong occupation, which, he felt, was a worthwhile one. He returned after just over a year, disillusioned. According to him, it costs, on average, about £5,000 to dig a well. The budget for that period was almost £200,000. After digging two wells, the money had run out. When wells were actually dug and a clean water supply provided, more often than not, the supply soon ran out – the locals simply didn’t seem to understand that it was not an inexhaustible supply and left the tap running the whole time. Do people realise, that a lot of these charities depicting starving or deprived of water children scenes, are leased from speciality film companies that make these films for charities. Whatever one wants to argue about the good and bad points of charities like water aid there is one thing they all have in common which says it all they all seem to have head offices in the dearest part of the country london central with the equally highest paid staff in the country in those offices What message does that send out to the donors that support this traversty ?